to allocate his portfolio between two asset classes. • The second asset class is a safe alternative, with a return of 3 percent and a standard deviation of zero The safe alternative can be either a bank savings account or a government bond. 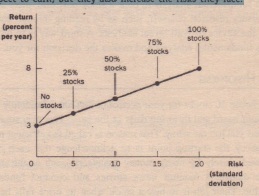 Each point in this figure represents a particular allocation of a portfolio between risky stocks and the safe asset. 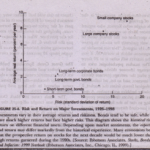 The figure shows that the more a person puts into stocks, the greater is both the risk and the return Acknowledging the risk-return trade-off does not, by itself, tell us what a person should do. The choice of a particular combination of risk and return depends on a person’s risk aversion, which reflects a person’s awn preferences. But it is important for stockholders to realize that the higher average return that they enjoy comes at the price of higher risk. 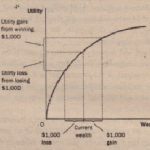 When people increase the percentage of their savings that they have invested in stocks, they increase the average return they can expect to earn, but they also increase the risks they face.